Women make up approximately 10% of the cycling population and unfortunately only get this percentage of attention from bicycle frame and equipment manufacturers! Are you getting saddle pain? Are your neck and shoulders hurting while cycling? Having bikefitter and experienced cyclist and triathlete Kate Luckin on staff, we really understand the requirements to get females comfortable on the bike, as well as the available women specific equipment available to get the most out of your cycling. Let us know if you are having issues as a female cyclist and would like Kate to be involved in your bikefit process. Saddle discomfort and soreness is a common issue amongst female cyclists, however is a topic which is not openly discussed (especially with the male helping you at your local bike shop). Over time, as women’s cycling has become more popular, the topic has come to the forefront of many cycling conversations. A comfortable saddle can make riding bliss, just as much as saddle discomfort can turn a long ride into an unpleasant experience, leaving ‘down there’ sore and damaged. Saddle discomfort is mainly caused by pressure of your body weight on the sit bones (ischial tuberosities), the pubic bone and therefore the soft tissue around the area (perineum). Saddle discomfort can have other compensatory issues, as it can change the way you sit on the bike. This can lead to poor posture which in turn, can lead to pain elsewhere in the body such as the back and neck. The following article by Rachel Olson from Cobb cycling has answered many ‘embarrassing’ questions from females and has simplified saddle choices for both road and triathlon saddles based on whether your anatomy describes you as an ‘innie or an outie’. Correct saddle angle. The saddle angle can have a profound effect on the rotation of the pelvis and pressure distribution. As a general rule, a saddle should be level. Correct bike fit. 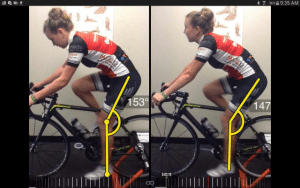 An incorrect bike fit can cause excessive pelvic movement, increased weight distribution on incorrect areas of the saddle and other issues which can result in increased discomfort and chaffing. Cycling Shorts. Cycling shorts and chamois are also very personal, however a seamless chamois with anti – bacterial fibres are a popular choice. It is also recommended not to wear underwear underneath cycling shorts. Chamois Cream: Chamois cream is an anti – bacterial cream which can help in the prevention of chaffing by creating a layer between your cycling kit and skin preventing friction. Chamois cream is more of a ‘preventative’ measure to help prevent saddle sores. Again, the creams are a personal choice, but brands such as Rapha, Assos and DZ Nutz all make great creams.